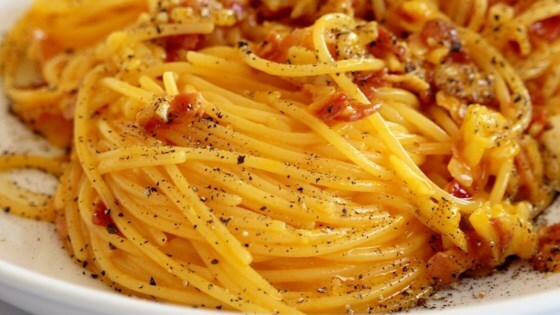 "Unlike a lot of recipes out there for spaghetti carbonara, this is the true Italian recipe from an Italian! You can't get more authentic than this recipe! Top with extra Pecorino-Romano cheese, salt, and pepper. Note there's no cream, just eggs, and Pecorino Romano cheese is used, not Parmesan." Heat a skillet over medium heat; cook and stir guanciale until crisp, 5 to 10 minutes. Whisk egg yolks and egg together in a bowl; add Pecorino-Romano cheese, salt, and pepper and whisk well. Stir in guanciale. Add spaghetti and toss until evenly coated. If the egg mixture becomes too thick, add a little of the cooking water from the pasta to dilute the sauce. But remember, the eggs should never be scrambled! I used bacon and I added a quarter cup of cream and a cup of peas. Turned out great. This was great with a few additions. I added quite a bit of extra pasta water and it was still a tad dry. Next time I’ll add pasta water, a bit of cream, and perhaps another egg. Great simple recipe. Don't forget to reserve 1 cup of the pasta water to mix in with everything. That starchy water will give it a nice creamy texture and keep it from being overly sticky. Delicious! I didn't have guanciale, so I used prosciutto and it was still good. Highly recommend!